Vive la France! : Has UNITAID unlocked the secret to sustainable foreign aid? As the U.S. government struggles with momentous decisions on taxes, spending and deficits, a recent poll asked voters what spending they’d cut. Their answer: almost none. For 18 of the 19 government programs tested, majorities wanted to either increase or maintain current spending levels. The only exception? Foreign aid. That sums up the dilemma facing the international development community. With the world still recovering from the 2008 financial crisis and many developed countries drowning in debt, there’s little public appetite for sending money abroad. In the face of growing global need, many have concluded that what’s needed is a painless, sustainable way to channel money from the wealthy to the poor – one that doesn’t depend on fickle donors or overburdened national budgets. UNITAID may have found one. Established in 2006 by the governments of Brazil, Chile, France, Norway and the United Kingdom, its mission is familiar: to increase developing countries’ access to drug treatments and diagnostics for HIV/AIDS, TB and malaria. But its financing model is something new: Most of UNITAID’s funding comes from a levy on airfare tickets in nine of its 28 member countries. The organization complements this funding with multi-year contributions from governments and other donors, including the Bill & Melinda Gates Foundation. In the six years since its founding, it has already provided billions of dollars to international partners working in global health, including the Clinton Health Access Initiative (CHAI) and UNICEF. Among its accomplishments, UNITAID says that it funds the treatment of seven out of 10 children being treated for HIV/AIDS worldwide. I spoke with Philippe Douste-Blazy, chairman of the executive board of UNITAID and UN Under-Secretary-General in charge of Innovative Finance for Development, about the origins and challenges of UNITAID’s innovative funding model, the ways it works through the free market to increase the accessibility of drugs, and its ambitious plans to expand its impact. James Militzer: Where did the idea for UNITAID’s funding model come from? 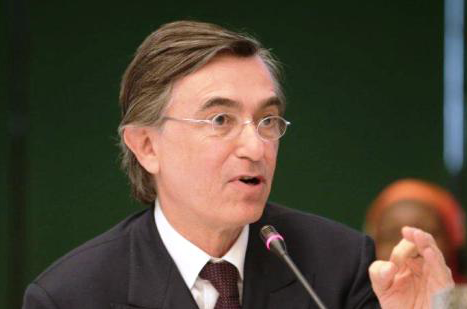 Philippe Douste-Blazy: With the current economic and financial crisis, the budgets of different western countries cannot allow those countries to continue to increase their official development aid. So we can see a scissors effect, with the increase of the needs of developing countries and a decrease of financing. With this crisis, we pay – here in western countries – with an increase in the unemployment rate. But the developing countries pay for this crisis with an increase of deaths – and particularly an increase in the mortality rate of children. So we decided to pass a financial law on July 13, 2006, in France, to take one micro solidarity contribution of about one dollar per plane ticket. It’s absolutely painless for the traveler, because one dollar is nothing – it is the price of a coffee. It’s painless for the state as well. But one dollar is the difference between life and death for three children with malaria. And little by little, [similar laws have been passed] in nine countries. And thanks to this small idea, we raised over two billion dollars in six years. UNITAID is the first – small, it’s true – but the first laboratory on innovative financing for development. What is new? It’s a tax, you know. But it’s the first time that a French tax is not going to the minister of finance and the economy in France, but directly to UNITAID, which is an international, multilateral body. So I think it’s a very new way to create the first solidarity organization. JM: Why did you choose to raise money through a business tax? PDB: I think that because I am French, we begin with a tax, you know? (laughs) Because it’s easier. The globalization of the economy has been done by businessmen. The globalization of communication has been done by businessmen as well – Twitter, Google, Microsoft, etc. But unfortunately, the only people who can do the globalization of solidarity are politicians – and they haven’t done so. We have to push governments to continue to give aid. But you know, it’s very difficult today to go to Greek or Italian or Spanish MPs, or congressmen in the U.S., and to say “We are going to increase aid to developing countries by billions.” Because a lot of people say, “But we have a lot of poor here.” It’s very difficult to explain, for public opinion. So we have to create this new way. JM: Isn’t it also difficult to convince governments to levy a new tax that will fund an international body that sends the money to other countries? But 1.5 billion people in the world don’t have any health, any education, any drinking water, any sanitation. So we have to invent a new model for the globalization of solidarity. It’s absolutely crucial. Why? Because if you don’t do anything for these 1.5 billion people who have nothing, with the Internet mobile, they are going to know, little by little, what is the cost of a meal in downtown New York, or in Washington or Paris. And for the price of a good meal in a restaurant in New York or Paris, you can save all the children with malaria, for two years, in their village. With this knowledge of the injustice between rich and poor, you are going to create humiliation, anger, and after that, conflicts and war. So I think that if we don’t do it for ethical and moral reasons, we have to do it for political reasons: so that our children and grandchildren won’t know a global war. JM: Why did you start with the air travel industry? PDB: We began with the air industry because you already have a lot of taxation on plane tickets, you know. And it’s very easy for an administration to add one dollar more. Also, every citizen in the world who can buy one plane ticket can pay one dollar more. If it’s in China, Japan, Mali or France, somebody who can pay for a plane ticket in first class or economy class – it is not the people in the street, it’s an MP, or a businessman. So it is not only north-south solidarity, but south-south solidarity as well. JM: How does UNITAID work through the free market to increase accessibility of drugs? PDB: For example, in the field of medicine, a researcher finds a new breakthrough drug and gets a patent. If you live in the U.S. or in Europe or Japan, it’s perfect, because you can buy this new drug at the pharmacy for your children, your parents or yourself. If you live in developing countries, you have to wait between 15 and 20 years for the patent to expire, before other companies can lower the price and you have the opportunity to get the same drug. It is one of the worst shames in the world. We signed the first patent pool for medicines in the world with Gilead, and now we’ve signed a joint venture between Glaxo and Pfizer for HIV/AIDS. We began with HIV/AIDS, but if you do that, you can have universal access to any drug in the world. JM: What’s next for UNITAID? PDB: I think it’s very important to understand that we can ask for a painless solidarity contribution on the main activities which benefit a lot from globalization. For example, Internet, mobile phones, financial collections, or tourism, with planes, etc. Do you know that Google pays only three percent in tax in the world, and Twitter and Facebook pay 2.5? But with Ford, or Honda, or Fiat in Italy, these companies pay between 25 to 35 percent in taxation. It’s not possible to continue like that. Capitalism is a very good system, but we have to think about solidarity as well. So now we’re pushing for a financial collection tax. If you take 0.01 percent of financial derivatives, or 0.2 percent of stocks, or 0.2 percent of obligations, you can raise billions and billions, and it is absolutely painless for the state, and for the richest. We did that in France last year. From the first of August 2012, there is a micro financial collection tax. And 11 European countries decided, at the same time, to do the same thing. In France, we are going to give 10 percent to developing countries. So we are now going to do a new fight, to convince (Germany Chancellor) Angela Merkel, and the prime minister of Austria, and Belgium, etc. to give 10 percent of this financial collection tax to developing countries too. JM: Do you think that other governments will be able to apply this mechanism to the financial industry, or will it use its political influence to prevent it? PDB: In the beginning, everybody said to me that I was crazy, and there were a lot of articles against this model. But this idea is now very respected. So I think that little by little, we are going to see the different parliaments implement this financial collection tax, because every western country has a lot of debt. The fight now is to convince governments to give a part of this financial collection tax to the poor – in their countries, but in developing countries as well. JM: Could UNITAID, or a similar model, catch on in the United States, or is the political situation too different? PDB: When I was minister of foreign affairs, in July 2005, the French ambassador to the U.S. said to me, “Do you want to meet a new politician in this country? Because in 10, 20, 30 years perhaps, this new politician could become president.” So I said yes, and we went to Chicago to see a new senator named Barack Obama. And two years later… (laughs).